If you go to see The Mowgli’s live and you don’t dance, were you really there? The answer is no. 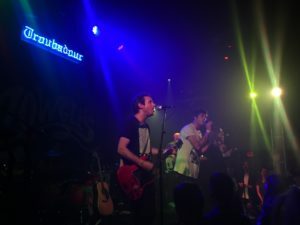 Plan to be dancing, sweating, and feeling all warm inside the way all live music should make you feel, however often times comes up short (especially with notoriously somber LA crowds). 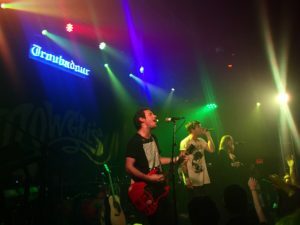 Wednesday night The Troubadour had a part dance party part love fest, kicked off by the energetic The Greeting Committee and the Pom Poms. For anyone planning on going to see this tour, do yourself a favor and go early, not only do the two opening acts have some seriously catchy tunes but they perfectly build up the momentum to The Mowgli’s lively set. The hometown crowd was also gifted with the presence of Daniel Franzese (AKA Damien from Mean Girls) who came on stage to intro the band. For old fans, you’ll be happy to hear that the set contained favorites like Emily, I’m Good, Say It Just Say It, Summertime and an encore of San Francisco. For new fans, this was a great show to hear some of the recent material the band has been working on, most notably their latest single Freakin’ Me Out. The six-piece is planning on releasing a new album this fall. Singer/songwriter Julia Nunes also came on stage abou halfway through the set to join the band for Clean Light. their unwavering enthusiasm – it’s contagious. Their live show brings a message of hope and love, they introduce songs with comments on self-love and positivity, and their energy on stage is immediately felt in the crowd. Vocalist Katie Jayne Earl said that the goal of their shows is to make the audience leave the night with a sense of happiness they didn’t have beforehand, and I can confirm that I paid it forward later on that night in the form of a huge hug to my Lyft driver. Spread the love, listen to The Mowgli’s, get your dance on.